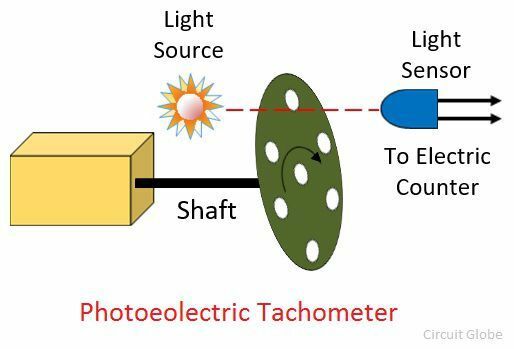 Definition: The tachometer which uses the light for measuring the speed of rotation of shaft or disc of machines is known as the photoelectric tachometer. The opaque disc with holes on its periphery, light source and laser are the essential parts of the photoelectric tachometer. The tachometer consists the opaque disc which is mounted on the shaft whose speed needs to be measured. The disc consists the equivalent holes around the periphery. The light source is placed on one side of the disc and the light sensor on the other side. They are in line with each other. When the disc rotates their holes, and the opaque portion comes alternatively between the light source and light sensor. When the holes come in the line of the light source and the light sensor, then the light passes through the holes and collapse to the sensor. Hence the pulse is generated. These pulses are measured through the electric counter. When the opaque portion comes in the line of light source and sensor, then the disc blocked the light source, and the output becomes zero. The production of pulses depends on the following factor. The number of holes on the disc. The speed of rotation of the disc. The holes are fixed, and hence the pulse generation depends on the speed of the rotation of the disc. The electronic counter is used for measuring the pulse rate. The digital output voltage is obtained, and hence there is no need of analogue to digital conversion. The pulses of constant amplitude are obtained which simplify the electronic circuitry. The life of the light source is approximately 50,000 hours. Hence the light source needs to be replaced timely. The accuracy of this method depends on the error which is represented by the unit pulse. These errors can be minimized by using the gating period. The gating period means the meter measures the frequency by counting the input pulses. The total number of pulses generated at one revolution is also used for minimizing the error.